Svetlana Kaminsky was born on November 25th, 1954 at the coast of the Baltic Sea in Jurmala, Latvia. She became interested in art at the age of 11, when she started to paint her first watercolors and to copy the drawings of the old masters, (Russian painter Alexander Ivanov and Leonardo da Vinci). 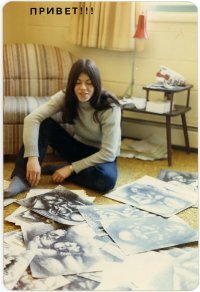 She graduated from high school in 1972 and took courses in medicine till 1975, still continuing to draw and paint. When she realised that drawing and painting were consuming all of her free time and she didnâ€™t want to live in the communist country, she left the Medical Institute in hopes to immigrate to Europe or America. Since then, her entire life was dedicated to art. She did not graduate from any art college or academy; she studied old masters in Hermitage by copying their works for a couple of years. She had some guidance and advice from some underground, non-conformist artists. The first was Alexander Arefiev, who, after seeing her works, inspired her to leave the Medical Institute. Her art from the beginning was expressive and could never be accepted by Soviet art committees. She presented her drawings for review only once. The work was rejected because of its â€œinappropriate themeâ€. By the end of the 70s, local collectors began to buy her artwork and so did some art collectors from America, Germany and Switzerland. At first, influenced by Chinese philosopher Laozi, she illustrated his main work, Tao Te Ching. Then F. Dostoyevsky and Kurt Vonnegut influenced her changed style and themes. This period was of dark fantasy of a desperate soul forced to live under totalitarian power. Slowly in her graphics, she found the deep and hidden way to survive in an ungodly country â€” the series Â«Old man and womanÂ» reflects that. In their own hidden world, the characters are surrounded by phantasmagorical still-lives. Her style finally found its completion based on two of her favorite artists â€” Rembrandt Harmenszoon van Rijn and Paul CÃ©zanne.Â Almost no material objects are left around the old man surrounded by children â€” as if there is nothing leftÂ in the world of pure teaching and learning about the great mystery of life. At the age of 25, she finally emigrated from the Soviet Union to obtain the so much desired freedom from the communist suppression and totalitarian regime, which she never could learn to tolerate or accept. Her last work was named Â«Life of ChristÂ». It consisted of large, never before attempted black and white graphic works made by a complex technique (Indian ink, water, brush and pen). After 1984, she retired from public life, leaving the contemporary world in order to dedicate herself to the spiritual life as a nun. She left all of her artwork to her brother, Eric Ershun, first and most faithful among her numerous supporters, to whom she dedicated her last graphic work Â«My brotherÂ».